This is a great hearty meal when you have some veggies you want to use before they go bad. It is easy to vary by changing the kinds of veggies you use. This recipe has a Southwestern flavor profile, yet with a few tweaks you could change it to Italian or Asian. The “cheese” sauce adds an ooey-gooey goodness that is sigh worthy. 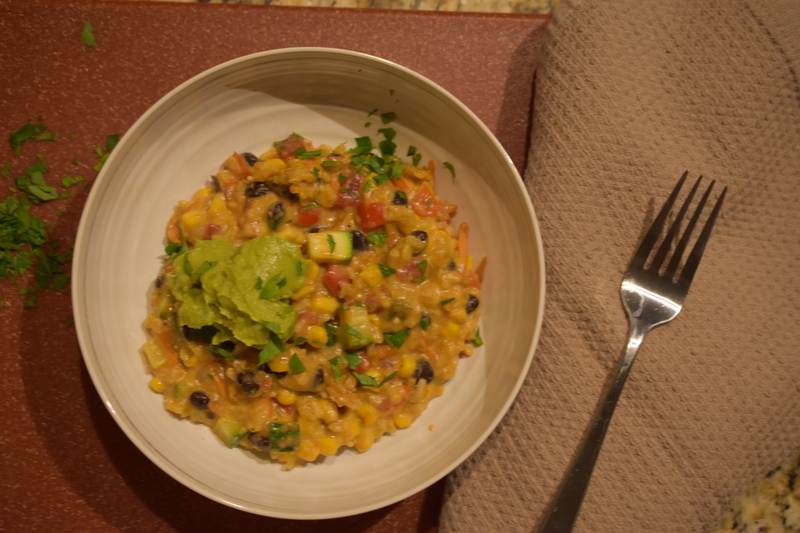 Top with some chopped cilantro and some fresh guacamole – Yum. In a large dutch oven over medium heat add onion, red bell pepper, garlic and carrots. Stirring occasionally until veggies are softened. Add vegetable broth as needed keep veggies from sticking to pan. Add Smokey Southwestern Seasoning, stir until veggies are covered with seasoning. Stir in brown rice, zucchini, tomatoes with chiles, corn and “cheese” sauce. Stir until well mixed. Spoon into large casserole baking dish. Bake for 30 minutes and casserole is bubbling. Garnish with Cilantro and Guacamole. Thank you. It is a hearty filling meal. I have a transformation meal tomorrow using this casserole. Ha, i read that one this afternoon, i’m getting behind on replying to comments! Thanks for stopping by. It is very tasty. I have a transformation meal posting tomorrow using the casserole.